We're big fans of Russian director Alexander Sokurov here. His 1997 Mother and Son (may i syn) was an astonishingly intimate and moving portrait of a young man as he comforts his mother in her dying hours. The 2002 Russian Ark (Russkiy kovcheg) was an audacious experiment shot intirely in St. Petersberg's Hermitage Museum that took us on a mesmerising trip through Russian history in a single, gloriously executed Steadicam shot. The 2005 The Sun (Solntse) was an utterly compelling study of Emperor Hirohito's last few hours as a living God, while the 2007 Alexandra explored the emotional bond between a young soldier and his elderly grandmother and the effect her arrival at his camp has on his comrades. And this is just a sprinkling. 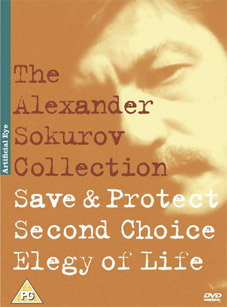 Now Artificial Eye are to release The Alexander Sokurov Collection, which will contain three Sokurov directed films that have never before been released on UK home home video, Save and Protect (1990), Second Circle (1990) and Elegy of Life (2006). Save and Protect (Spasi i sokhrani) is actually an adaptation of Gustave Flaubert's celebrated novel Madame Bovary, one that functions less as a standard narrative than a moving work of art, one the New York Times assures us is "full of wild and unruly rewards." In the 1990 The Second Circle (Krug vtoroy) a young man has to deal with the practical and spiritual consequences of his father's death, a film the LA Times called "a starkly beautiful, impressive and ferociously demanding exercise in pure visual cinema." The 2006 Elegy of Life (Elegiya zhizni. Rostropovich. Vishnevskaya. ), meanwhile, is a documentary portrait of famed musician Mstislav Rostropovich and his wife, Galina Vishnevskaya, who were described by Varoey as "one of the most remarkable husband-and-wife musical teams in history." Details of extra features have yet to be confirmed.